Good workforce planning helps allocate training resources efficiently and effectively. Western Australia follows its own workforce planning and development model which is managed through the Department of Training and Workforce Development. Victoria is about to tool up its workforce planning capability again with the appointment late in 2015 of the Victorian Skills Commissioner – the new Commissioner is Neil Coulson who worked as Deputy Reviewer with Bruce Mackenzie on the 2015 Victorian VET Funding Review. 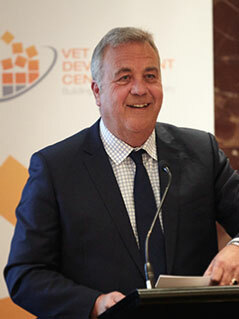 Neil was also the recent guest speaker at the VDC VET Leaders Lunch at the Park Hyatt in Melbourne on 17 June 2016. Tasmania has kept its shoulder to the workforce planning wheel, progressively establishing plans for a suite of industry sectors. The state’s consistent, long term approach means it has a historical perspective on how the workforce is evolving and how skills profiles are changing. Transport, Freight and Logistics Industry Skills Plan, 2011 (51 pages) which was recently updated as the Tasmanian Transport and Logistics Industry Workforce Plan 2015-2018 (50 pages). In preparing for the rollout of the National Disability Insurance Scheme, an updated Disability Workforce Strategy and Action Plan (40 pages) was added in May. You can find these plans via industry sector if you prefer on a page for Industry specific information and resources. There is more to come – workforce planning is never over. Next cab off the rank, and funded by Skills Tasmania, Engineers Australia is preparing a workforce development strategy for Tasmania’s engineering profession. Beyond the plans themselves Skills Tasmania has also produced workforce planning tools, most recently funding the Centre for Local Government at University of Technology Sydney to work with seven local councils on developing Workforce Planning Guidelines for Local Government in Tasmania (46 pages). The Guidelines, released in June, set out six steps for developing and reviewing individual local government authority workforce plans. If you’re interested to keep up with the state of play in Tassie you might like to sign up for the Skills Facts newsletter.